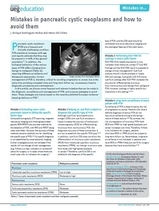 Although cyst fluid carcinoembryonic antigen (CEA) and cyst fluid amylase or lipase increase the accuracy of endoscopic ultrasonography (EUS) for differentiating mucinous from nonmucinous PCN, the diagnostic accuracy of these biomarkers is too low to establish the specific PCN type.10–16 In addition, cyst fluid CEA does not allow the differentiation of mucinous cystic neoplasms (MCN) from intraductal papillary mucinous neoplasms (IPMN), nor benign mucinous cysts from those with high-grade dysplasia or cancer.17 Therefore, cyst fluid CEA is not reliable for the diagnosis of the specific type of PCN, and the CEA level should be considered only as an adjunct to imaging and the cytological features of the cystic lesion. Figure 1 | Indications for surgery in patients who have IPMN and are fit for surgery. As the risk of cancer associated with IPMN is high for patients who have absolute or relative indications for surgery, resection of IPMN in those patients should not be delayed. By contrast, although malignancy cannot be definitively excluded before histological examination of a surgical specimen, the risk of high-grade dysplasia or cancer in patients with IPMN is low in the absence of risk factors.21 On that basis, and as a general rule, patients who have no indication for surgical resection (i.e. small cysts with no risk factors for malignancy) should not be operated on unless they develop an indication for surgery during follow-up. In this context, factors such as life expectancy, the patient’s compliance and wishes, and the surgical risk are important for appropriate clinical decision making. de Jong K, et al. High prevalence of pancreatic cysts detected by screening magnetic resonance imaging examinations. Clin Gastroenterol Hepatol 2010; 8: 806–811. Girometti R, et al. Incidental pancreatic cysts on 3D turbo spin echo magnetic resonance cholangiopancreatography: prevalence and relation with clinical and imaging features. Abdom Imaging 2011; 36: 196–205. European Study Group on Cystic Tumours of the Pancreas. European evidence-based guidelines on pancreatic cystic neoplasms. Gut 2018; 67: 789–804. Del Chiaro M, et al. Comparison of preoperative conference-based diagnosis with histology of cystic tumors of the pancreas. Ann Surg Oncol 2014; 21: 1539–1544. Jang DK, et al. Preoperative diagnosis of pancreatic cystic lesions: The accuracy of endoscopic ultrasound and cross-sectional imaging. Pancreas 2015; 44: 1329–1333. Lee H-J, et al. Relative accuracy of CT and MRI in the differentiation of benign from malignant pancreatic cystic lesions. Clin Radiol 2011; 66: 315–321. Sainani NI, et al. Comparative performance of MDCT and MRI with MR cholangiopancreatography in characterizing small pancreatic cysts. Am J Roentgenol 2009; 193: 722–731. Visser BC, et al. Diagnostic evaluation of cystic pancreatic lesions. HPB 2008;10: 63–69. Song SJ, et al. Differentiation of intraductal papillary mucinous neoplasms from other pancreatic cystic masses: comparison of multirow-detector CT and MR imaging using ROC analysis. J Magn Reson Imaging 2007; 26: 86–93. Al-Haddad M, et al. Performance characteristics of molecular (DNA) analysis for the diagnosis of mucinous pancreatic cysts. Gastrointest Endosc 2014; 79: 79–87. Brugge WR, et al. 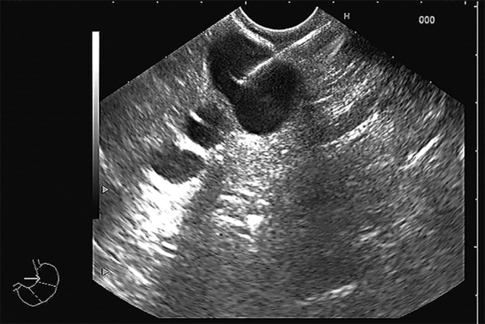 Diagnosis of pancreatic cystic neoplasms: a report of the cooperative pancreatic cyst study. Gastroenterology 2004; 126: 1330–1336. Cizginer S, et al. Cyst fluid carcinoembryonic antigen is an accurate diagnostic marker of pancreatic mucinous cysts. Pancreas 2011; 40: 1024–1028. Gaddam S, et al. Suboptimal accuracy of carcinoembryonic antigen in differentiation of mucinous and nonmucinous pancreatic cysts: results of a large multicenter study. Gastrointest Endosc 2015; 82: 1060–1069. Kadayifci A, et al. The value of KRAS mutation testing with CEA for the diagnosis of pancreatic mucinous cysts. Endosc Int Open 2016; 4: E391–E396. Khalid A, et al. Pancreatic cyst fluid DNA analysis in evaluating pancreatic cysts: a report of the PANDA study. Gastrointest Endosc 2009; 69: 1095–1102. Winner M, et al. The role of molecular analysis in the diagnosis and surveillance of pancreatic cystic neoplasms. JOP 2015; 16: 143–149. Ngamruengphong S, et al. Cyst carcinoembryonic antigen in differentiating pancreatic cysts: a meta-analysis. Dig Liver Dis 2013; 45: 920–926. Sedlack R, Affi A, et al. Utility of EUS in the evaluation of cystic pancreatic lesions. Gastrointest Endosc 2002; 56: 543–547. Jais B, et al. Serous cystic neoplasm of the pancreas: a multinational study of 2622 patients under the auspices of the International Association of Pancreatology and European Pancreatic Club (European Study Group on Cystic Tumors of the Pancreas). Gut 2016; 65: 305–312. Reid MD, et al. Serous neoplasms of the pancreas: A clinicopathologic analysis of 193 cases and literature review with new insights on macrocystic and solid variants and critical reappraisal of so-called ‘serous cystadenocarcinoma’. Am J Surg Pathol 2015; 39: 1597–1610. Del Chiaro M, et al. Survival analysis and risk for progression of intraductal papillary mucinous neoplasia of the pancreas (IPMN) under surveillance: A single-institution experience. Ann Surg Oncol 2017; 24: 1120–1126. Crippa S, et al. Active surveillance beyond 5 years is required for presumed branch-duct intraductal papillary mucinous neoplasms undergoing non-operative management. Am J Gastroenterol 2017; 112: 1153–1161. Lawrence SA, et al. Should patients with cystic lesions of the pancreas undergo long-term radiographic surveillance? : Results of 3024 patients evaluated at a single institution. Ann Surg 2017; 266: 536–544. Sahora K, et al. Effects of comorbidities on outcomes of patients with intraductal papillary mucinous neoplasms. Clin Gastroenterol Hepatol 2015; 13: 1816–1823. Sahani DV, et al. 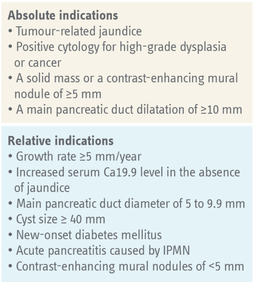 Diagnosis and management of cystic pancreatic lesions. Am J Roentgenol 2013; 200: 343–354. Waters JA, et al. CT vs MRCP: optimal classification of IPMN type and extent. J Gastrointest Surg 2008; 12: 101–109. Pilleul F, et al. Preoperative evaluation of intraductal papillary mucinous tumors performed by pancreatic magnetic resonance imaging and correlated with surgical and histopathologic findings. J Magn Reson Imaging 2005; 21: 237–244. Goh BKP. International guidelines for the management of pancreatic intraductal papillary mucinous neoplasms. World J Gastroenterol 2015; 21: 9833–9837. Sugiyama M, et al. Predictive factors for malignancy in intraductal papillary-mucinous tumours of the pancreas. Br J Surg 2003; 90: 1244–1249. Nilsson LN, et al. Nature and management of pancreatic mucinous cystic neoplasm (MCN): A systematic review of the literature. Pancreatology 2016; 16: 1028–1036. Faitot F, et al. 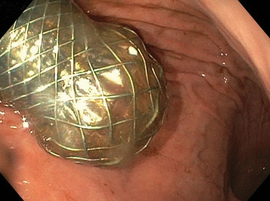 Reappraisal of pancreatic enucleations: A single-center experience of 126 procedures. Surgery 2015; 158: 201–210. Goudard Y, et al. Reappraisal of central pancreatectomy a 12-year single-center experience. JAMA Surg 2014; 149: 356–363. Kromrey M-L, et al. Prospective study on the incidence, prevalence and 5-year pancreatic-related mortality of pancreatic cysts in a population-based study. Gut 2018; 67: 138–145. Das A, et al. Incidental cystic neoplasms of pancreas: what is the optimal interval of imaging surveillance? Am J Gastroenterol 2008; 103: 1657–1662. © UEG 2018 Domínguez-Muñoz and Del Chiaro. Cite this article as: Domínguez-Muñoz J.E. and Del Chiaro M. Mistakes in pancreatic cystic neoplasms and how to avoid them. 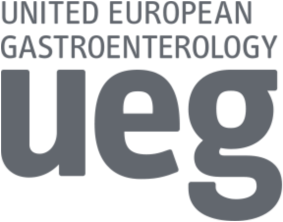 UEG Education 2018; 18: 35–37. J. Enrique Domínguez-Muñoz is Director of the Department of Gastroenterology and Hepatology, University Hospital of Santiago de Compostela, Spain. Marco Del Chiaro is Chief of Surgical Oncology, Director of the Hepato-Pancreato-Biliary Program, Department of Surgery, University of Colorado Anschutz Medical Campus, USA. Conflicts of interest: The authors declare they have no conflicts of interest in relation to this article. Published online: November 29, 2018. J. Enrique Domínguez-Muñoz is Professor of Medicine and Chief of the Department of Gastroenterology and Hepatology at the University Hospital of Santiago de Compostela, Spain. He is dedicated to and interested in the field of pancreatic diseases in terms of clinical management, education and research. He has actively participated in and co-authored the United European Gastroenterology evidence-based guidelines for the diagnosis and therapy of chronic pancreatitis (HaPanEU), and has authored more than 250 publications. Marco Del Chiaro is Professor, Chief of Surgical Oncology and Director of the HPB program at the University of Colorado Denver, USA. He is a pancreatic surgeon with a special interest in the treatment of cystic tumours of the pancreas and locally advanced pancreatic cancer. Professor Del Chiaro is one of the most clinically experienced physicians in the treatment of advanced pancreatic tumours with pancreatectomies associated with vascular resection and reconstruction. He is one of the leaders of the European Study Group on Cystic Tumours of the Pancreas and coordinator of the European evidence-based guidelines on pancreatic cystic neoplasms. ‘Cystic pancreatic lesions’ session at UEG Week 2018. ‘From guidelines to clinical practice: Cystic pancreatic lesions - differential diagnosis and management’ session at UEG Week 2018. ‘New insights in the diagnosis of cystic pancreatic lesions’ session at UEG Week 2018. ‘Pancreatic cystic tumours’ presentation at 25th UEG Week 2017 also available translated into Spanish. ‘Rising Star: Pancreatic cystic neoplasias: Diagnostic approach and when to resect?’ presentation at 25th UEG Week 2017. ‘Management of cystic lesions of the pancreas’ presentation at 11th EDS Postgraduate Course, Budapet 2017. ‘Pancreatic cystic lesions: When to sample them? How to follow them?’ presentation from EFISDS & EPC Postgraduate Course 2015. ‘IPMN – what have we learnt from the Guidelines?’ presentation at EFISDS & EPC Postgraduate Course 2015. Tringali A, et al. Intraductal biliopancreatic imaging: European Society of Gastrointestinal Endoscopy (ESGE) technology review. Endoscopy 2015; 47: 738–753. Buscarini E, et al. Italian consensus guidelines for the diagnostic work-up and follow-up of cystic pancreatic neoplasms. Dig Liv Dis 2014; 46: 479–493. Del Chiaro M, et al. European experts consensus statement on cystic tumours of the pancreas. Dig Liv Dis 2013; 45: 703–711.